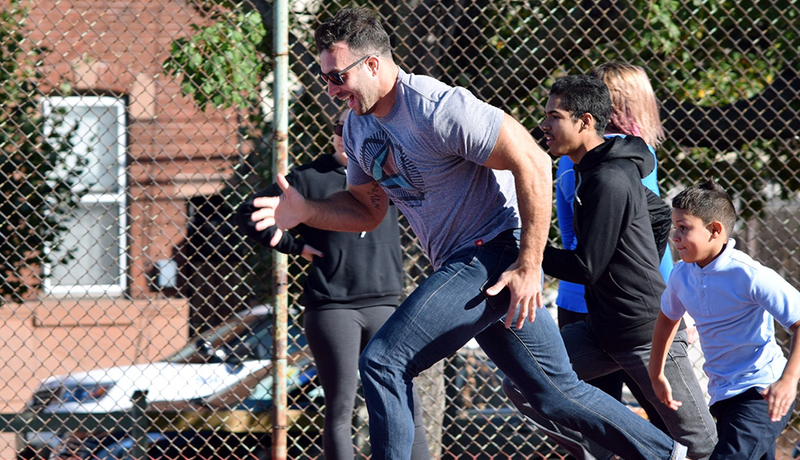 Growing up, Connor Barwin’s parents never shied away from a community assist. “My entire life, they always stressed the importance of taking care and being involved,” he says. His coaches, many of which volunteered their time, also helped to show the young football player how important it was to give back to the neighborhood. When Barwin moved to Philadelphia — in 2013, after he was signed to play with the Eagles — he held onto that philosophy. “I knew that it was time to take a leadership role in my new community, and do everything I could to make it a better place,” he says. The Make the World Better Foundation aims to improve neighborhoods by rebuilding the parks and public spaces that once served as their heartbeat. Barwin and his team speak with community members, learning what they envision their space to be and then working side-by-side to make that dream a reality. To coincide with the Be Well Philly Health Hero Challenge, presented by Independence Blue Cross, our three VIPs will face off to win $2,500 to benefit the charity of their choosing. Starting October 23rd, you can vote for your favorite Health Hero Challenge finalist — and put your bid in for this year’s VIP — right here. Below, we talk to Barwin — this week’s Very Influential Philadelphian — about the past successes of MTWB, and what the future will hold for his charity. Can you talk about your personal ties to parks and recreational spaces? Parks played a huge roll in my upbringing and thankfully still do today. As a kid, I loved to go the park and play pickup basketball with the other neighborhood kids. Today, during the offseason, I still love to do the same thing. Without access to clean and safe parks, what are kids in Philadelphia missing out on most? There are incredible lessons to be learned, and experiences to be had, for kids at parks. What people also miss — and what we really try to focus on — is how important public parks are for a sense of community for the entire neighborhood. Public parks should be places where everyone comes to have fun, get exercise and interact with their neighbors. How has MTWB successfully helped improve community spaces in Philadelphia — what would you say is the foundation’s biggest success story? Our biggest success is seeing the way our first park, Ralph Brooks Park, has thrived since the park reopened in 2015. The community gardens surrounding the park have flourished, a basketball league has formed and grown and the court is in constant use. I am also very excited for the final phase construction at Smith Playground to be completed this year. Smith is our biggest project, a seven-plus acre park. The final phase includes brand new turf football and baseball fields. You are also very involved in the local music scene. Who in that community has helped MTWB and how? Because of the incredible people in the Philly music scene, we have had four successful benefit shows to raise money for neighborhood parks in Philadelphia. There have been a lot of people that have helped me from the music scene, but no one more than Sean Agnew. Sean has not only helped book the shows but also donated his venue, Union Transfer, and his staff for our first three shows. Our fourth concert was recently held at the city-owned Dell Music Center and I think Sean actually put in even more time this year. Union Transfer was closed that night and he and his staff were still with us making it another great night. Two of my favorite things in this world are music and sports, and my foundation brings them together to make Philadelphia a better place. You quickly became something of a hometown hero, through your professional career and philanthropic efforts, but what draws you to Philadelphia on a personal level? I have a lot of love for Philadelphia, but what I love most are the people. Philadelphia is full of great people that care deeply for their city. Their work ethic and grit are what I think draws me to the city the most. Read more about this year’s Health Hero challenge now.